*Got a couple of samples, and I bought the rest! I have been hearing about tampons that have synthetic materials and have been treated and bleached for years, but I never knew of a convenient alternative. Organic tampons are pretty expensive for a tiny box. The Diva Cup and other brands of menstrual cups have been on my mind, but having read both the positive and negative reviews, it was a purchase that I kept putting off. 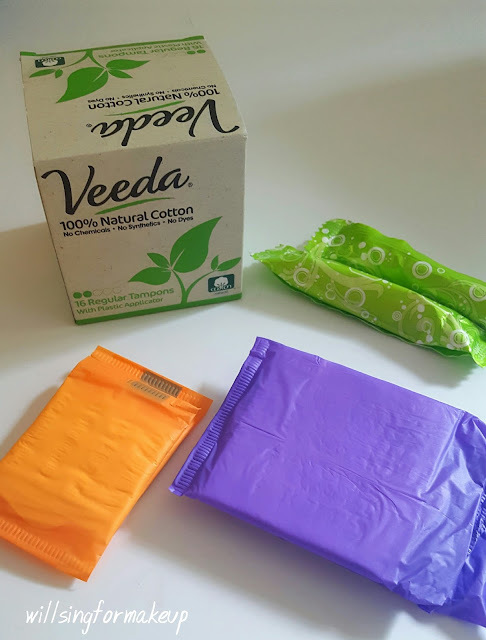 Then, I started reading reviews from other bloggers about a brand called Veeda that offered 100% cotton feminine care products that weren't treated with chemicals or dyes. Immediately, I investigated the website and checked the store locator to see if any products were available at my local stores. Lucky for me, two of my local supermarkets popped up in the results! 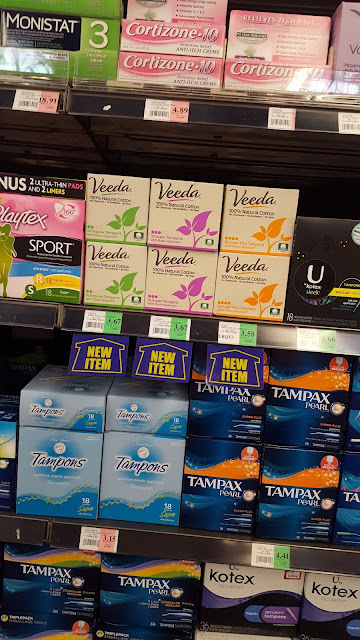 The first store that I checked had just gotten Veeda's tampons and was selling them at a really good price. I checked the other store soon after, and they didn't have any of Veeda's products on the shelves. I'm hoping that if I go back soon I will find them there. I would love to be able to purchase the pads and liners at a store. Of course, all of Veeda's products are available on their site. If you're on the fence about ordering online, they have free shipping in the US! These products are a must for anyone who is sensitive to irritation that many feminine care products can cause. This is a sensitive area we're talking about here, and most of the time, I have a good bit of irritation from pads and tampons by the end of my period. These products actually help in reducing that. Veeda has tampons with plastic applicators and applicator-free. I have used the regular tampons with the applicator, and they are just as easy to use as others I have tried. The tampons meet the same standards of absorbency as other tampons and are FDA approved. Because these are all cotton, they don't leave behind any fibers once removed. Evidently, rayon can do that! For more information on synthetics, chemicals, dyes, etc. you can visit the Veeda FAQs page. I was lucky that someone from Veeda contacted me after I commented on another blog about being interested in this brand, and they sent me a couple of tampons, pads, and liners to try. So, I was able to try the pads and liners, if only briefly. While I don't prefer pads, I do use them at night. The couple I got to try were comfortable and more absorbent than the Always pads I had been using. I definitely felt drier when I got up in the morning than I usually do. The liners are very comfortable, and I didn't feel them at all when I used them. None of the Veeda products I tried caused any irritation at all. Like the tampons, the pads and liners are made of 100% cotton. I definitely recommend Veeda if you've been looking for some kind of alternative to the pad and tampon options we have now. I'm so glad that these are sold in a couple of stores where I live!